Bugging devices of this caliber are able to transmit far because of its unique circuitry and extended broadcast antenna. The Super Wireless Transmitter is an audio transmitter that broadcasts powerful, clear sound. 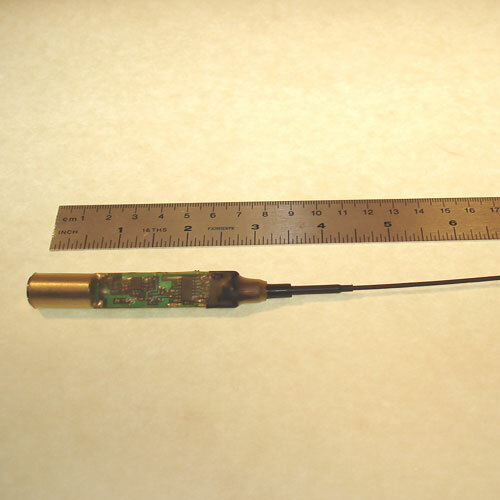 It can be body worn as a bugging device, or left behind in a room for room bugging, or even in a vehicle in effort to penetrate the metallic body of a car or truck that generally hinders rf transmissions. Its powerful signal will travel much further than regular bugging devices when placed in a vehicle. Its design is similar to the GCOM WMTX series, yet because of the antenna's size, it is able to send audio radio frequency signals much further away. Used for conversation capture, the Super Wireless Transmitter G1410 can be customized to operate on up to 7 communication channels. The Super G1410 option employs an extra high sensitivity circuit which allows the user to pick up sound from up to 50 feet away. The transmitter employs state-of-the-art surface-mount technology, making it the most effective wireless audio transmitter of its kind.